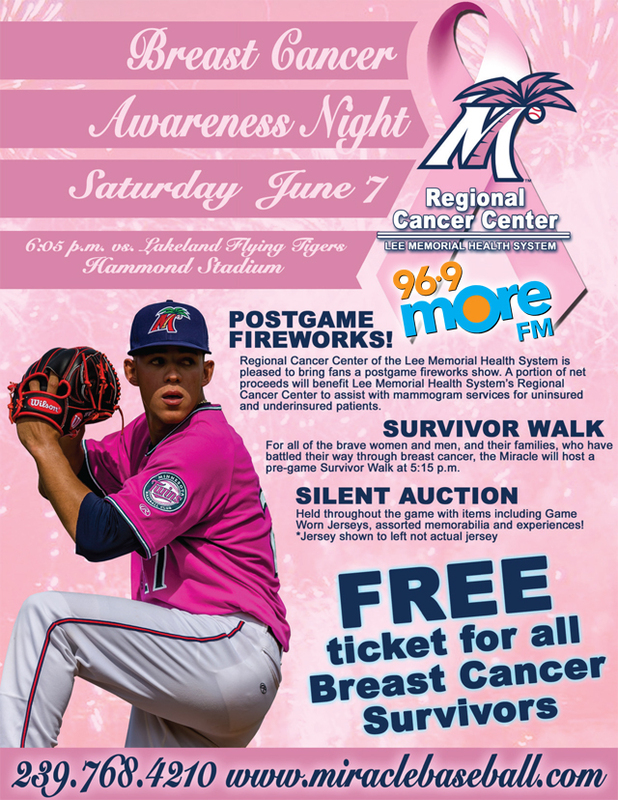 On Saturday, June 7, the Fort Myers Miracle will host a very special evening at the ballpark with the 5th annual Breast Cancer Awareness Night presented by the Lee Regional Cancer Center and 96.9 MORE FM. The Miracle play the Lakeland Flying Tigers at 6:05 p.m. at Hammond Stadium and fireworks will light up the Southwest Florida sky after the game. Breast cancer survivors will receive a free ticket to the game. The first 500 women to come through the gates will receive a pink bag compliments of Vein Specialists. In honor of breast cancer survivors, the Miracle will wear pink jerseys that will be available for auction during the game. The auction will take place on the concourse and conclude in the middle of the sixth inning. Fans with the winning bids will be invited onto the field after the game to receive the jersey from the respective player. The silent auction will also other items including a Key West Express tickets, local hotel and restaurant certificates, dinner and show for four from the Broadway Palm Dinner Theatre, a Chicago White Sox Robin Ventura autographed jersey, a Paul Molitor autographed jersey and ball and much more. A portion of the net proceeds from the jersey auction, silent auction and raffles will benefit the Lee Memorial Health Systems Regional Cancer Center to assist with mammogram services for uninsured and underinsured patients. Prior to the game, a survivor walk will begin at 5:15 p.m. around the warning track at Hammond Stadium. Fans who are survivors, and their families, are invited to take part. Fans can enjoy a SINK or SWIM Saturday. For just $12, fans get a wristband for All You Can Drink domestic draft beers through the sixth inning. Tickets are available at the Miracle offices on the third floor of Hammond Stadium from 9 a.m. to 5 p.m., Monday through Friday. Fans can purchase tickets online at www.miraclebaseball.com or call (239) 768-4210. 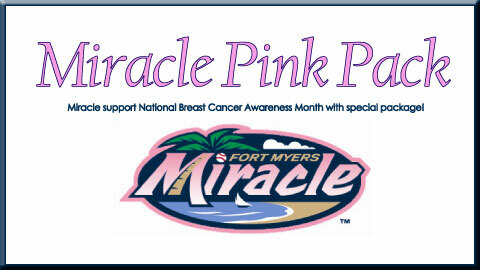 FORT MYERS, Fla. (May 30, 2013) – On Saturday, June 8, the Fort Myers Miracle will host a very special evening at the ballpark with the 4th annual Breast Cancer Awareness Night presented by the Lee Memorial Health System Foundation and Sun Broadcasting. The Miracle play the Bradenton Marauders at 6:05 p.m. at Hammond Stadium and fireworks will light up the Southwest Florida sky after the game. The first 500 women entering the ballpark will receive a pink tote bag compliments of McDonald’s. Gates will open at 5 p.m. In honor of breast cancer survivors, the Miracle will wear pink jerseys that will be available for auction during the game. The auction will take place on the concourse and conclude in the middle of the sixth inning. Fans with the winning bids will be invited onto the field after the game to receive the jersey from the respective player.The silent auction will also other items including a Key West Express Round Trip flight from Air Expeditions Seaplane Adventures, dinner and show for four from the Broadway Palm Dinner Theatre, a two-day, one-night stay at the Crowne Plaza including gift certificates to Shoeless Joe’s Sports Cafe, gift certificates from Norman Love Chocolates, the Prawnbroker restaurant, the University Grill and much more. Compliments of 94.5 The Arrow and Scream Guitars, there also be a special raffle for a one of a kind pink electric guitar. A portion of the net proceeds will benefit the Lee Memorial Health Systems Regional Cancer Center to assist with mammogram services for uninsured and underinsured patients. Prior to the game, a survivor walk will begin at 5:15 p.m. around the warning track at Hammond Stadium. Fans who are survivors are invited to take part. Proceeds from the jersey auction, silent auction and raffles will be used to assist with mammogram services for uninsured women and men in the community. FORT MYERS, Fla. (November 12, 2012) – The Fort Myers Miracle are holding a hurricane relief sale to help raise funds for those in need after Superstorm Sandy made landfall in the northeastern United States in late October. The Miracle will offer the official 2012 on-field fitted cap with the 20th anniversary logo for $20 with $5 of each sale donated to Hurricane Sandy relief. The hat is all navy blue and features the “M” logo on the front. “Playing any role we can to help and assist all affected by Superstorm Sandy is very important to us,” said Miracle General Manager Andrew Seymour. The Fort Myers Miracle Professional Baseball Club teamed up with Grace Church to provide toys this Holiday season for the less fortunate. The Miracle donated hats, baseballs, shirts, blankets and jackets, while Grace Church distributed the items to those in need. We are thrilled with the donation that the Miracle Baseball Club made to our Christmas Gift Giveaway. We were able to assist over 100 children with Christmas gifts, and the Club’s huge donation served as a way for us not to have to turn anyone away, there were gifts for everyone, even those who hadn’t signed up in advance,” said Pastor Arlene Jackson. “The Miracle are happy to support charitable organizations that positively impact our community,” said Miracle General Manager Steve Gliner. Grace Church is located in downtown Fort Myers. The campus during the past month, collected toys that were given away to needy families on Christmas Eve. Grace Church at 2415 Grand Avenue, Fort Myers, is dedicated to serving and forming relationships with the local neighborhood and offers a free meal and worship service every Wednesday night as well as free Sunday morning breakfast before and during their two worship services at 10 & 11:30am. They are also open to partnerships with other organizations to provide meals, clothing and other services. 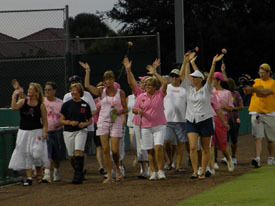 On August 21, 2010 the Fort Myers Miracle played host to the Bradenton Marauders on Breast Cancer Awareness night at The Bill. The night consisted of a double header against the Marauders with a silent auction that took place during the second game. 21st Century Oncology sponsored this night with all proceeds from the auctions going to Partners for Breast Cancer Care. The Miracle players wore pink jerseys to signify and promote breast cancer awareness. Following the end of the game, fans that won jerseys in the silent auction were lead onto the field to receive their jersey right from the player’s back. 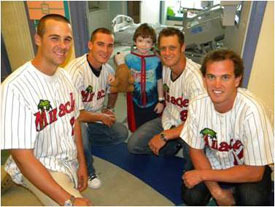 This provided fans with the opportunity to take pictures and have their jersey signed by the Miracle team. Other auction items included golf packages, hotel getaway packages, autographed baseballs, bats and pink bases. Partners for Breast Cancer Care is a Southwest Florida based non-profit organization that helps qualified men and women with the diagnosis and treatment cost of breast cancer. Helping over 7,000 men and women since their start in 2004, Partners for Breast Cancer Care has become a staple in the Southwest Florida Community and a friend to the Fort Myers Miracle. The Miracle fans donated over $6,500.00 to Partners for Breast Cancer Care through various silent auction items, raffles and jewelry sales that went on during the game. 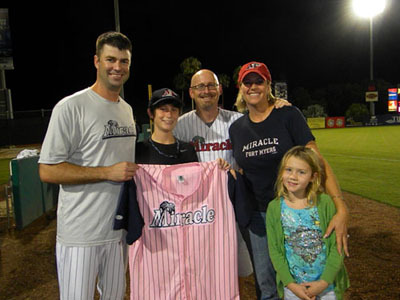 This was the first year the Miracle teamed up with Partners for Breast Cancer Care and 21st Century Oncology. With the success of this year’s auction the Miracle are excited to see what next year will bring. The Fort Myers Miracle are proud to announce that Rebecca Garcia has been awarded the Florida Marlins / Florida State League scholarship. 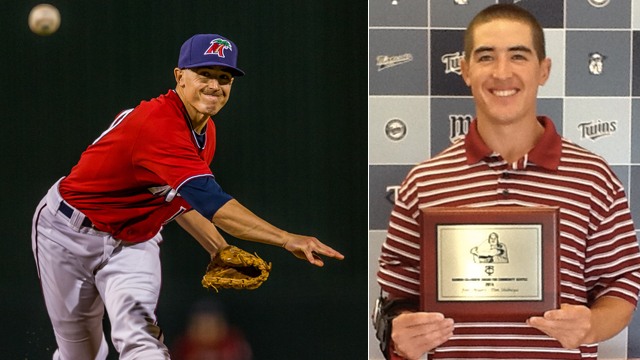 Each year the Miracle and the 11 other teams in the Florida State League partner with the Florida Marlins and award one deserving person from each club a $1,500 educational scholarship. Garcia, a Fort Lauderdale native, is currently a senior at Florida Gulf Coast University and slated to graduate in December, with a degree in Sports Management and Marketing. She is in her first summer as a game day volunteer with the Miracle, learning the finer points of the team’s extensive game day operations. She also has been very active in the nightly operation of the team’s merchandise shop. The Florida Marlins have sponsored the program with the Florida State League the past 11 years through their Community Foundation and the Executive Director, Nancy Olson. The foundation has now contributed $95,000 to this program. The award is based both on financial need and grade point average of 3.0 on a 4.0 scale. To be eligible for the scholarship, students must be a member of the team’s gameday operations team, an employee of, or the child or grandchild of an employee of the participating club during the 2010 Florida State League Season, and must be at least a high school junior by the 2010 Fall Term. “I have learned so much this summer. I can’t even begin to describe my experience and all the knowledge I have gained from the Miracle staff”, said Garcia. Miracle Cares is a community outreach program that was founded in the Fall of 2008. The Fort Myers Miracle front office staff recognized the need for volunteers in the community and took it upon themselves to be those people. Each month the Miracle volunteer some of their work time to helping local organizations in need. This year organizations such as the CCMI soup kitchen, Ronald McDonald House and Salvation Army were assisted in there drive for helping others. Thursday, April 15th the Miracle pushed up their sleeves and went to work in the kitchen of the Ronald McDonald house cooking some ballpark favorites for dinner. “It’s something simple for us to do and yet the families have been very appreciative” says General Manager, Steve Gliner. The Miracle lent a hand at the local soup kitchen earlier this year, serving over a hundred people within just a couple hours. The team turned full circle when they visited the Children’s Hospital on April 26th. The visit consisted of stopping at the Oncology/Hematology, Intensive Care and Surgical units. Children’s faces lit up with joy seeing professional ball players walk into their room to visit. Some kids jumped right into their arms, while others took a little time to warm up to. The kids took to the players right away and began cracking jokes and giving high fives. At the end of the day the kids were just kids, all illnesses momentarily aside.